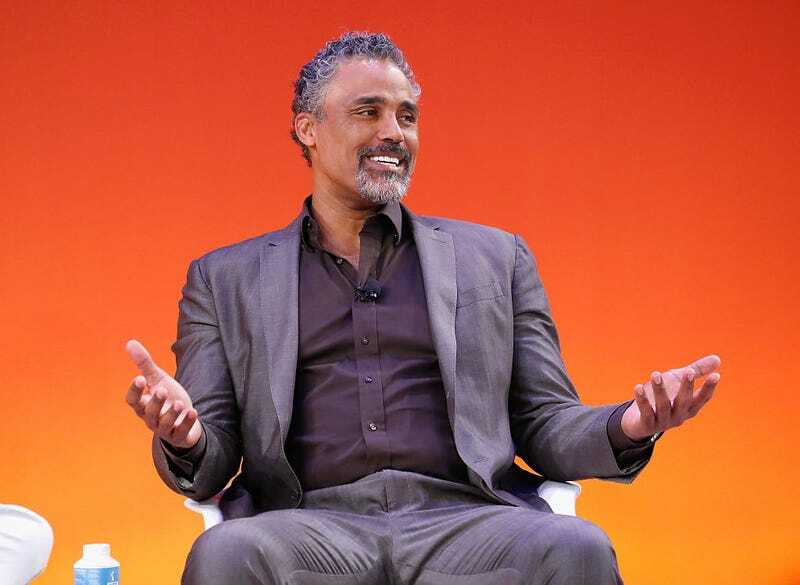 If You Can, You Should Totally Meet Rick Fox. You Know, Rick. Fox. One of the fun things about this here semi-charmed life of mine is that over the course of the past, say, 12 years, I’ve had the opportunity to meet more famous folks than I can shake a stick at. At this point, it’s harder for me to remember who all I’ve met; I’ve probably forgotten more folks than I can remember. I do remember various interactions though. Like the time Rob Brown from Finding Forrester, Coach Carter and The Express fame came rolling through the nightclub I worked at and not wanting the famous-actor treatment, or Q-Tip from A Tribe Called Quest who was supposed to spin a paid gig one night but a band member from the group RAMP, whose song “Daylight” was sampled for ATCQ’s hit single “Bonita Applebum,” showed up and bent Q-Tip’s ear for the entire evening. He never did spin. He did get paid. Lately, I’ve had the opportunity to sit and talk with famous folks from television shows I know and love. One such opportunity was meeting Rick Fox. I’d like to tell you about meeting Rick Fox. Why? Because it’s Rick Fox. You know, Rick. Fox. Because of my prolificness in writing about African-American television and cinema, I’ve managed to hit various radars. One such radar was from the folks who run the Martha’s Vineyard African-American Film Festival, held annually in Oak Bluff’s, Mass. One of the founders asked me to speak on a panel at their Color of Conversation Film Series and because she enjoyed my remarks there, told me she’d love to get me up at the film festival that August in Martha’s Vineyard. Eventually, along with Oprah’s OWN, I was asked to moderate a conversation for the season 3 premiere of one of my favorite shows, Greenleaf, featuring show star Merle Dandridge, writer/executive producer Kriss Turner-Towner and Rick Fox. In college, one of my boys actually had a Los Angeles Lakers Rick Fox jersey. Once I knew that I was going to meet Rick Fox, I figured that I’d have to find some way to break the ice because Rick Fox is a famous dude. So, Rick Fox, you just gonna take an interest in me? I’m sure you do that to everybody. He was funny and tall and had wavy hair and looked like a model. All J. Crew’d out and what not. So I’m in the “green room” chopping it up with these folks responsible for a show that I love and we’re all getting along famously. This is great because one of the most awkward things ever is moderating a panel and the convo doesn’t feel genuine or smooth. The panel was dope, and like I said, Merle, in particular was awesome. At the conclusion of the panel, do you know what happened? I’ll tell you what happened. Rick Fox came up to me to tell me that I did a great job. Silly of me, I was like, “Really? Hey, thanks, Rick Fox, that means a lot.” And you know what? It did. It did mean a lot because that’s Rick Fox. Then to top it off, as I’m sadly leaving Martha’s Vineyard, waiting to catch a ferry back to Providence, Rhode Island, I get a text alerting me that Rick Fox shouted out me and Very Smart Brothas on Twitter through a video of him remarking about VSB on the panel. So Rick Fox is not only encouraging, he doubles down with extending his network to help a brotha out. What do I have to say about that time I met Rick Fox? Well, Rick Fox is awesome. I’ve met many, many famous folks, to the point where being starstruck isn’t really a thing for me any longer. But every now and then you meet a celebrity who seems like a genuinely nice person and while I have no clue what he’s like in his regular day-to-day personal life, what I do know is that Rick Fox made me feel special. Rick Fox is one of my favorite people to meet now. You should meet Rick Fox, too.